Spring comes on little goat feet. . . . If I were a scholar fixin’ to write a research paper, I would like to explore the use of Fauns, Satyrs, and the god Pan in English literature. This is a topic that has long intrigued me. These enigmatic figures dance through the shade and the starry darkness of our consciousness, but what is our fascination with them? Bear with me — no, goat with me — if you will, gentle readers, and let’s embark — embark — on a little walk among the trees. (I’ve just paid about ten bucks to the pun fund — at this rate I’ll be broke by the end of the next paragraph.) I’d like to do a little defining, a little comparing of examples, and finally a little theorizing about our wild friends, the horned pipers in the glens. Detail from Self-Portrait by Frederic S. Durbin, March 2010. Zimmerman tells us that Pan (Greek) is the same as Faunus (Roman). So if I were that scholarly type fixin’ to do the research paper, I’d have my work cut out for me, chasing down all those references! Fortunately, I’m just a blog-tender, so I can deal in rumors, unsubstantiated “facts,” opinions, and whims. I can just tell you what I think. And that’s the beauty of a blog, right? We read and write them in order to talk about cool stuff — which, of course, sometimes has great applicability to our lives and our projects and our service, whatever it may be. So much for the definitions: now we know whom we’re talking about; we know what the theme is as we consider the variations. I would say the Faun in Pan’s Labyrinth fits role #2, that of messenger and mentor in things magical. I wouldn’t quite go so far as to put him in the “helper” (#4) category, because at times he’s downright scary, and I’m not altogether sure he cares about Ofelia or necessarily wants her to succeed — he’s just there to deliver the messages. (Does anyone want to disagree? I realize it’s quite open to interpretation — but he certainly seems heartless and creeps me out in some of his scenes.) He’s there to tell Ofelia what she must and must not do in order to get back to her kingdom beneath the ground. (Maybe deep down he cares, because he does get angry at her when she messes up and almost blows it.) He’s the face and the voice of the magical kingdom deep within the Earth, a kingdom inaccessible to humankind. For the darkest uses of Pan-like figures I know of, we turn to the Welsh author Arthur Machen (1863-1947). Machen first published a story called “The Great God Pan” in 1890, which he revised and extended into a novella in 1894. It’s readily available today, and for anyone who considers him/herself a serious fan of fantasy or horror fiction, it’s an essential book. Encountering the devil in the woods: what early American writer does that make you think of? Hawthorne, right? Beyond the village lies the dark, fathomless woods, which is the abode of witches and the devil. Pan in The Great God Pan is made all the more horrible by how subtly Machen handles things. We never see Pan in immediate narrative; in fact, a theme of the book is how the human mind cannot handle seeing “the great god Pan” directly. (And in that aspect, one can certainly trace the enormous influence Machen had on H.P. Lovecraft! Doesn’t that sound like vintage Lovecraft? The evil is so horrible that, if you see it, your mind is shattered, and you become a raving lunatic.) In Machen’s book, we glimpse Pan only through suggestions and secondhand accounts — and in a grotesque, ancient carving excavated from the wall of a house that sends a boy (who has earlier encountered a strange man in the woods) into paroxysms of fear. [“The head is pronounced by the most experienced archaeologists of the district to be that of a faun or satyr. [Dr. Phillips tells me that he has seen the head in question, and assures me that he has never received such a vivid presentment of intense evil. ]”] Crossing paths with Machen’s Pan leads to madness, obsession, and death. Nor does Machen hesitate to plunge into the sexual associations of Pan-lore. I don’t want to give away the plot to any interested in reading it, so I guess I’ll stop there with my references to this book. Now let’s move on to role #4 and fill our lungs with fresh air. Narnia! Faithfulness and friendship! The Faun Tumnus is a definite type 4, the helper. So is Mr. Girandole in The Sacred Woods. Like Tolkien’s Elves, like Mr. Spock the Vulcan, like some instances of the new face of the vampire in popular culture, benevolent Mr. Girandole represents a solid ally who is a little better than we are in nearly every way — stronger, wiser, older, more capable — and yet vulnerable and all too human in some surprising ways. Unlike type #1, which tantalizes us with unfulfilled — or only momentarily fulfilled — longing; and unlike type #2, which is only an interface with Nature for us, the kindest Fauns usher us not to destruction like the #3’s, but to a better state. Heh, heh! I realize I left Mr. Tumnus out in the cold and am not really talking about him at all — maybe some of you Narnia fans can help me out with him. Ooh! Ooh! Something just now occurred to me! Look at the Kenneth Grahame quote! I would bet money that it’s no accident Grahame wrote “It was no panic terror.” Are you aware of the fact that our English word “panic” comes from — yes, you guessed it — the name of Pan? My Webster’s dictionary says of “panic” that it’s from the Greek panikos, literally “of Pan”: “of, relating to, or resembling the mental or emotional state believed induced by the god Pan.” What Arthur Machen creates in The Great God Pan could hardly be any more authentic or true to the ancient Greek concept! So what is the appeal? Why do these figures haunt and inform our literature? Well, here are my theories: at their worst, they give an embodiment to terrible forces beyond our control — the Unknown, the Evil, the destroying impersonal onslaught of Nature. And they provide a not-quite-human face for the worst elements in us ourselves. Lust and debauchery . 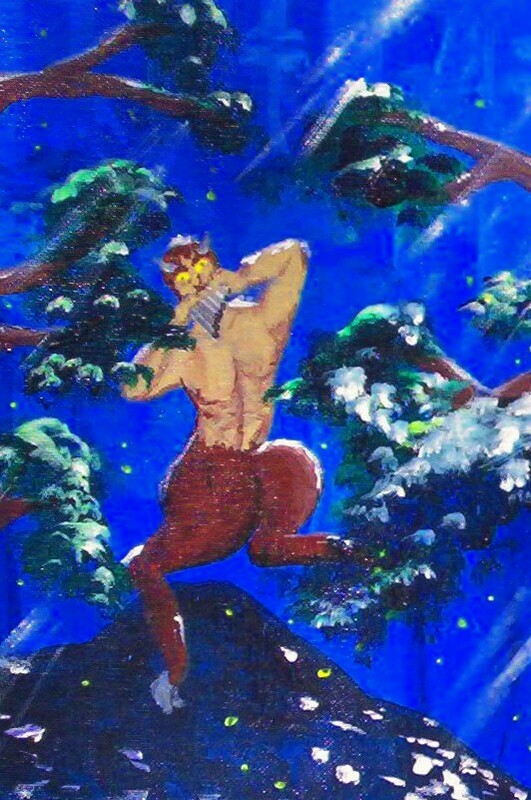 . . in this way, I think there may be some connection between Satyr myths and werewolf legends. Jekyll and Hyde. “We have met the enemy and they is us.” They give a face to the Forest, to its mystery and allure — and in this way, they may be related to the figure of the Green Man. At their most benevolent, they represent that holy awe we feel when experiencing Creation as God made it: the green spaces where we can practically hear Him breathing . . . where we are afraid, and yet not afraid . . . not of the Piper at the gates of dawn. Heh, heh — I don’t want to distract anyone from the previous post with my tomfoolery, so if you haven’t read “Thin Walls” yet, click up there on those blue words and read my Christmas recollections. But if you’ve been there and done that, here’s a silly little something that I found — quite literally — at the back of my closet. Today I was putting away my late autumn jacket, since its days of usefulness are gone for another year. (I’m now into my Totally Serious Winter Coat.) And at the back of my closet, behind the hanging shirts . . . no, there was no lamppost, no entrance to Narnia . . . but there was an old corkboard from my previous apartment. And still pinned to the corkboard was this sonnet that I wrote several years ago. Now, who can tell me what sort of sonnet this is? Is it Petrarchan or Shakespearian? Is it Italian or English? Do they still teach such things in school? The first person to ring in with the right answer gets the privilege of making a request or suggestion for the next posting on this blog — which I may well use, if I in my megalomaniacal dictatorship of this blog see it fit to use. And maybe I’ll knight you. To place a piece with you seems quite a stunt. Has got me pulling out my thinning hair. But (lucky you!) my newest work’s complete! With details that appeal to every sense. But find enclosed my latest grocery list.